AEP CEO Nick Akins (right) answers a question posed by Tom Knox (left), a reporter from Columbus Business First newspaper, during the “Fueling Ohio’s Future” event Jan. 14 at the Columbus Metropolitan Club. Photos by Jennah Nelson. Nick Akins, AEP chairman, president and chief executive officer, fielded questions about a wide variety of industry and strategic topics Jan. 14 in Columbus as part of the “Fueling Ohio’s Future” luncheon series sponsored by the Columbus Metropolitan Club and AEP. The moderator of the question and answer session was Tom Knox, a reporter for Columbus Business First newspaper. Knox: You’ve not been shy about voicing concerns about brownouts or other issues from retiring coal-fired generation the next couple of years. A lot of your opponents think AEP is just crying wolf. Can you address that and explain why you think there will be issues with reliability? Akins: Two years ago when the (U.S.) EPA went down the road that required the retirement of a large amount of generation in this country, the question became, “Is it being done too quickly?” Two years ago, we (AEP) were the first out of the blocks saying there was going to be an issue with the grid itself, particularly in times like we had last winter with the polar vortex. That generation is depended upon to run 24/7 and is a critical component of keeping the grid as reliable as it is. Fast forward to today, and the regional transmission organization (RTO) is asking units if they can run longer because they see issues coming up, particularly in the summer and winter next year. We’re retiring about 6,000 megawatts of coal-fired capacity in May of 2015. Overall, the country is retiring about 25 percent of its coal-fired generation. You can’t retire that much generation that quickly and not have impacts on the system. It takes years to put transmission facilities into place. It takes years to get through the regulatory processes of the state jurisdictions to get approvals to build (generation). Then you add the Clean Power Plan, which has very aggressive timelines for compliance. There are 2020 targets for reductions of CO2 emissions and there are 2030 targets for reductions. Our big issue, as well as that of the industry and 26 states, is that we don’t have time to meet the 2020 targets, and that will force more retirements in generation. In fact, our studies show that the utility system will not be able to operate. That’s a very hard thing to say because we have had a reliable grid for decades and decades, and the American economy is built on the ability to flip the light switch and the power and energy is there. That is at risk. Knox: One of the bigger stories in energy (in Ohio) last year was the passage of Senate Bill 310, which put the freeze for two years on the state’s renewable standards. American Electric Power was one of the bigger vocal supporters of that bill. Why did AEP support that bill? Akins: We have pretty substantial energy efficiency programs that we’ve been working through, and we’ve worked very positively on them with the commissioners and our customers. We would like to continue that, but the real issue is, “How do you evaluate the cost of energy efficiency components relative to other resources?” What we were really arguing was for the commission (Public Utilities Commission of Ohio) to determine the right approach. I don’t mean to be pejorative here, but we have a lot of states and a lot of legislators during election season that like to outdo each other. If one state comes up with 25 percent (renewables), then another state’s going to be 30 (percent), and now you have California that wants to go to 50 (percent). There’s a limitation to renewables and there’s a limitation to energy efficiency. It has to be a balanced energy approach that includes energy efficiency and renewables, but also recognizes the value of the other resources that are being brought to the table, and the commission is in the best place to be able to evaluate those issues. So, yes, we were supportive of it but I don’t think we were the lead company. At the same time, we want to make sure there is adequate analysis and review so we are making wise decisions. Knox: How does AEP as a giant company co-exist with incoming renewables and alternative forms of energy? Akins: There’s an assumption out there that utilities aren’t doing anything on renewables when, in fact, utilities are building more renewables than anyone else. AEP has 2,000 megawatts of renewables, and we provide the Purchase Power Agreements (PPA) to make those renewables possible. We are not the developer of them — we actually outsource to contractors and others to build the facilities — but we have the Purchase Power Agreements that allow them to go to the banks and get the financing for these projects. We also have a PPA for centralized solar at one facility in Ohio, and another in our Indiana-Michigan territory. We are very focused on the transformation that needs to occur (in the utility industry) but there must be some sense of balance associated with it. Knox: Oil and gas drilling has helped the eastern part of the state, and it’s helped with gasoline prices for everyone. Can you talk specifically about the impacts of shale gas on AEP? How is that going to change American Electric Power in the coming years? Akins: Historically, the reason AEP was predominantly coal-fired in the eastern part of its service territory — its Midwestern states — was because natural gas wasn’t very prevalent. All of a sudden, we have major pipeline capacity coming in from different parts of the country, and then we have the shale gas revolution that enabled natural gas to be prevalent in this part of the country. It became a bonafide resource that we can start to transition to, and we have added about 5,000 megawatts of generation assets and put that natural-gas-fired capacity in place over the last decade, and it’s running today. We started that transformation and it enabled us to continue to retire coal-fired units and put natural gas facilities in place. Today, you have a lot of natural gas that’s available at very cheap prices. The question is, can you depend upon it 24/7 because the pipeline system has not caught up with the shale gas activity. It’s important for us to get the infrastructure in place so it becomes a substantial resource for us in the future as we make the transition from coal to other resources. It’s a positive for Ohio and, in my opinion, one of the travesties is that we haven’t been able to take advantage of it. If there were adequate price signals to build new capacity here in Ohio, more generation would get built here, but that’s not happening. Ohio is sitting like the hole in the middle of a doughnut. Other states around us are primarily regulated, they have integrated resource plans, they know what they are going to invest in, they have the price signals through regulations to tell them what they can build, but that doesn’t exist here in Ohio, and that’s unfortunate because the Utica Shale is significant for Ohio like the Eagle Ford Shale has been for Texas in terms of economic and industrial growth. Knox: Talking about deregulation, I know you have various issues with it here in Ohio, and Ohio is one of your bigger sources of revenue. How do you operate in that this is your home state but you prefer to operate in a regulated market? Akins: An unregulated market can work if you have the proper construct in place to support it, and that doesn’t exist (in Ohio). That doesn’t mean it won’t exist at some point, but it doesn’t exist today. We continue to invest heavily in our transmission and distribution here in Ohio, and I think it’s important for us to continue to focus on that infrastructure development and the customer experience. Not spending on generation in Ohio is a problem for the future, and it’s something we’re trying to fix, but there are challenges with that effort. We do not have enough capacity in the state of Ohio to serve AEP’s load, and that’s not a good place to be. That means you’re importing energy from states around you. That’s something that needs to be fixed. If we were still in a regulated market here, we would be investing in natural gas, but that’s not the case. Knox: What’s the biggest issue for AEP in 2015? Akins: The biggest issues for AEP in Ohio are our purchase power arrangement and the disposition of our competitive generation. 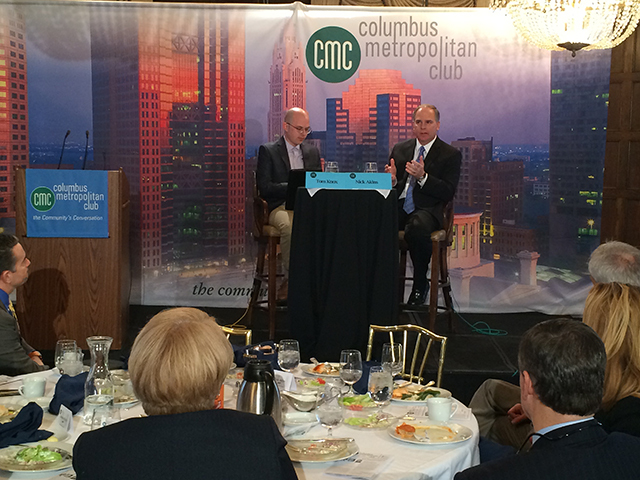 Those are the two key issues, and we need policy direction from Ohio to understand which direction we’re going to go. It’s very important for us to know how to invest, particularly in the generation part in Ohio. Transmission and distribution will continue to flourish in Ohio. Ohio is a big part of AEP, and AEP will continue to be a big part of Ohio.